L’Art d’écrire follows the Core French Curriculum Guidelines of the Ontario, Canada Ministry of Education for Grade 9, FSF1D. 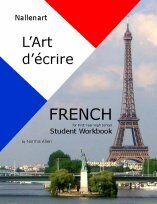 This course provides access to all the student and teacher resources necessary for L’Art d’écrire 1, including reproducible student worktext pages, audio files, answer keys, tests, weighting charts, and curriculum guidelines. For printed materials and individual downloadables, visit the Curriculum Shop. Your sample page links to a 404 page. I would love to see a sample of this curriculum and/or a scope and sequence for it. Thanks!